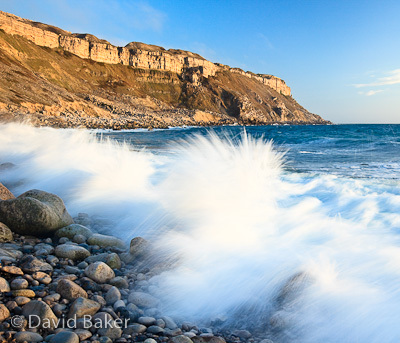 Another image from last night taken at West Weares, Dorset, I have had a few failed trips to the location, however, yesterday evening it all came together, golden light from the setting sun hitting the cliff and the waves crashing in around me did the trick……oh and yes that wave did give me and my camera a soaking! ~ by David Baker on 26 April, 2010. Nice bit of drama in this. You have caught the wave just at the right moment. Did you forget your Big Stopper?